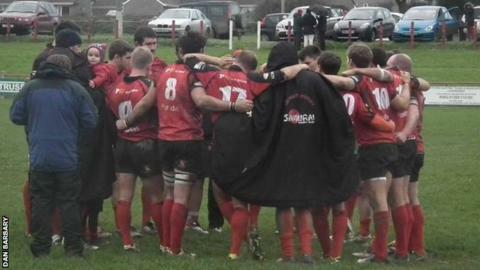 Redruth head coach Ashley Morcom says the club needed structural changes because of their struggles with debt. An extraordinary general meeting was called after a number of the executive committee, including the treasurer and assistant treasurer, resigned. A number of local businessmen, including former players, are said to be interested in getting involved. "Something had to happen and this has happened for the best," Morcom told BBC South West Sport. Morcom continued: "We've been close to administration as long as I can remember. "If it was left as it was, it may have happened, maybe not this year, but possibly next. "We're making a profit now, so we're doing something right, but we're paying off historical debt - week-on-week a new debt occurs." Redruth RFC is run as a members club and over 120 people attended the EGM after the board was reduced from 10 members to just four, with a second meeting set to be held to co-opt their replacements. Club secretary Roger Watson is remaining in post and he believes the supporters can still play a huge part in helping the club's recovery. "After the EGM last Thursday, I'm a lot happier than I was a week earlier," Watson said. "You can have the best plans in the world but if you're used to gates of over 800 and then you get gates of 400, obviously action has to be taken. "It's not just the gate money, it's the spend while in the ground that suffers. We've also found it very difficult to sell match-day hospitality this season." The Reds have slipped to 12th place in National Two South following the 46-22 defeat at Canterbury. The financial problems may also be having an effect on the field after the team made the 650-mile round trip to Kent in a day, in a bid to make savings. "A hotel and coach would normally cost around £3,000, but doing it by minibus saved us over £2,000," head coach Morcom added. "It's frustrating as we're low on player numbers and we're just getting our act together on the playing side and starting to put in some performances."